Posted by Rugui Xie on October 29, 2018 Enter your password to view comments. Posted by Rugui Xie on October 1, 2018 Enter your password to view comments. Posted by Rugui Xie on September 10, 2018 Enter your password to view comments. Recent turnaround on the topic of new transportation technology “autonomous vehicles” most attributed to many high profile companies like Google, Tesla, Uber and Lyft pioneering the technology, how much benefit it will bring to people and how soon it will become to reality are still remain on puzzle. 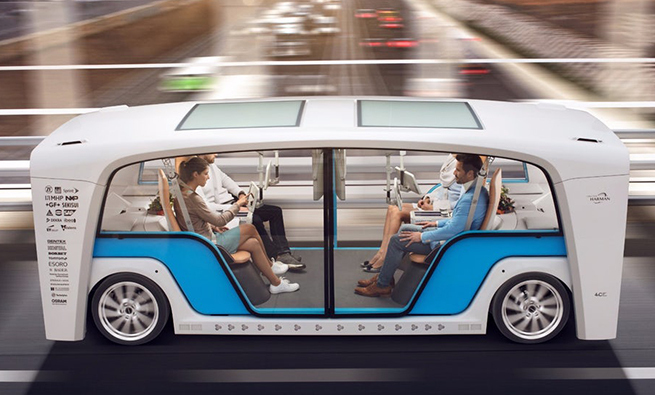 The article discussed about the future of the “autonomous vehicles” from three different perspectives. From the efficiency perspective of both car and drive. As we know, cars always need drivers to operate them with focus, so it requires each driver to have a private car ownership in order to drive legally. However, will the efficiency increase if there is a car can drive by itself? It could go anywhere regardless of the owner’s location, people will be able to hail rides from other people’s car when they are not using them, and you can directly drop off at the destination without wasting time on finding the parking spot, or a AV can pick you up at any location you prefer in the shortest time. It is not only increase the average use of each car, but also increase the efficiency on people’s daily commute. Financially, autonomous vehicles require less cost on driver’s ownership, related insurance and repair expenses, as well as parking. Because of its ride-sharing character, certain people like car lovers or wealthy may give up their cars due to the trend of sharing car. In fact, more families will reduce their cost on car purchase due to the ride sharing function of the autonomous vehicles when one car cannot fulfill the need for a family that has more than four persons. Now, one car can take every family member to their own destination and keep sharing more ride to other who need an emergent ride at the moment. Architecturally, autonomous vehicle will bring a big change on city planning and architecture in the future. For some building, the number of parking space is a pre-determined element need to be designed in order to be built. When car can drive themselves and share ride to each rider, there is less or even no need on the parking spot accommodate in the building. During some big event or rush hour, distribution of the cars can be more flexible as well. At less active times, a portion could retreat to structures until they are needed again. They could park in the structures that are already built in our cities, but the number of these cars will likely be lower, and with AV technology, take up much less space by being able to park only inches apart from one another. From another point, autonomous vehicle will also affect three other main architectural space, 1. the design of many skyscrapers with their base parking space foundation. 2. The garage building in urban city center 3. The numerous parking that surround plaza and shopping mall. The result will be: all of these parking spaces will be no longer needed in future. Some architects already foresee this transportation revolution before they design the buildings, for example, the design strategy of The Grove in Los Angeles parking garage predict a ride-sharing car ownership by 2025, the ceiling of the parking garage is higher, flat floor and skylight are all been used in parking garage, and even a spiral ramp, just so that one day it could be used as retail space, offices or apartments. From the urban planning perspective, autonomous vehicle will have decreased the need for car as well as the roads. The drop on private car and increase on self-driving buses which can hold a great number of passengers will encourage a more walkable city, and more pedestrian friendly infrastructure in the city. Instead of focusing on on-street parking or parking lot design in city, drop-off and pick-up zone and their distance to all the buildings nearby will become the new essential in urban design. Another interesting point the article points out is that Avs will ultimately transfer the main transportation from cars to a high-capacity public transportation, such as fixed-route buses or railway. Avs will decrease the use of car, so high expense maintenance cost each year on roads becomes less necessary for a small portion of cars. Cars will most likely become a portal or shuttle for people from their home to train or bus station. In author’s opinion, AVs will dramatically change our future but the only uncertainty will be on citizens of each city, will people embrace this new technology in a short time as they imagine? How long these advantages will be continuing within the scope of the city? how people will response to this change and how much people can accept to this possibility in the future when Avs is coming to our life. Testado, Justine. “Developing Flexible Parking Garages for a Rideshare-Dependent LA.” Archinect, Apr. 2018, http://archinect.com/news/article/150003454/developing-flexible-parking-garages-for-a-rideshare-dependent-la.